E.O.S. 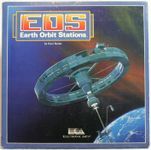 : Earth Orbit Stations was a space station management simulation developed by Karl Buiter and produced by Joe Ybarra for Electronic Arts in 1987 for the Commodore 64, Apple II, and Apple Macintosh. The game focused on both the material and economic challenges of building a permanent, fully functioning space station in geocentric orbit. The game was set in 1996, and the player was given various selected scenarios to fulfill, from mundane tasks such as setting up a simple space station to developing and supplying a specified amount of high-grade, zero G pharmaceuticals to being the first to contact alien life. The game also was a cut-throat strategy game in multiplayer, as players competed over finite resources and resource management. Source: Wikipedia, "Earth Orbit Stations", available under the CC-BY-SA License.